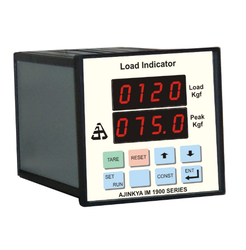 Our Load / Weighing Indicator are Micro-controller based highly versatile controllers for Weighing / Batching Applications. Various controlling options are available to control drive, solenoid etc. to control material in the hopper. Load cell/weighbridge interface is provided to cover a wide range of applications. Typical applications are Weighing and Batching, Loss in Weight Control, Hopper Control etc. Options like Printer interface / PC Interface / 4-20 mA output make it versatile connect to PC or SCADA software or feed values to PLC. Remote Large displays are available to show the weighing results along with information like set values, weight, charges etc. for applications like Truck weighbridges, Octroi information displays etc. Apart from weighing application, these indicators are useful for Test and Measuring applications like Tensile / Compression / Burst / Pressure measurement. Peak hold facility makes it useful to measure the impact / breaking tension. Along with elongation measurement, these controllers can be used to calculate properties like Young’s Modulus, Shear Stress etc. Looking for Electronic Weight Controllers ?